Sarees are a traditional ethnic wear that measure between 4 and 9 yards. Even though it is just a piece of cloth, it emboldens and magnifies the female form in its prime from the bottom to the top. Sarees are preferred by women all over the Indian subcontinent for festivals and all occasions. It is a sure shot eye turner and is surely going to make you the star of the party if you can drape it properly and carry it off well. Women not only wear sarees to look good, but it also increases their self-esteem and sense of pride. Nalli silk sarees is famous for its silk cotton kanjeevaram and benarasi sarees and start at price 2000 INR and go up to 20000 INR. Sarees help to bring out the feminine qualities in women. There are numerous advantages to wearing sarees. They mold well with the figure and bring out the best qualities in the torso of the adorner.Tall, thin women, can drape her saree tightly around her waist and pleat it tightly against her body. She can drape her pallu loosely to avoid looking to thin. Short, plump women can easily look less short and plump when she drapes her pleated saree loosely around her waist and drapes her pallu tightly. Just by changing the color of the blouse you can change the entire face of the saree. It is possible to complete transform yourself after wearing a saree. A silk saree from Nalli silk sarees oozes oomph grace and style. The best shop is pretty much the universe of modern ethnic clothing in India. 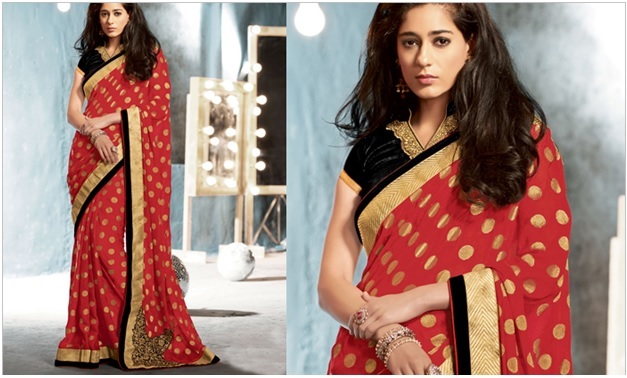 Sarees are not only good looking but also easy to wear. It is a comfortable piece of clothing that is suitable for all occasions. Be it for a wedding or for a casual outing. Nalli silk sarees possess the most exquisite collection of sarees that you will find in the market. Their godhwal silk saree is the most popular saree. Recently designers have started to westernize the concept of saree to bring about a modern touch to the Indian traditional dress. Designers have recently started to incorporate fusion designs into their sarees. The use of embroidery work and beautiful patterns and colors has made the saree an exclusive wear for women. Women prefer to look elegant and attract attention when they go to aparty, a silk saree is the best way to look the part on any occasion.Nalli silk sarees has kanjivaram silk sarees from South India,Odishan silk sarees and Kerala silks that sell like hotcakes amongst the fashion conscious women of Delhi. This is such a shop that you are sure to found the best deals in terms of prices for the sarees in the market. However before buying the perfect saree make sure to check out and try out the sarees to check which one suit you better and that which suits your body shape the best. Samar Pahwa has been working as a lifestyle blogger and SEO/Social media expert. Currently, I am involved with Zakoopi, local fashion discovery platform.